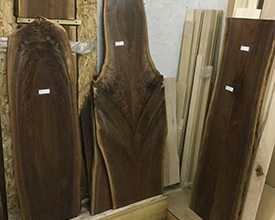 Our table size live-edge slabs are all about uniqueness, beauty and making a statement. Our inventory is constantly changing so stop in or give us a call. If there’s something special you’re looking for, let us know! A board foot is a unit of measure equal to the board’s thickness times its width times its length, divided by 12. For example, a board 1″ thick, 4″ wide and 3′ long is 1 board foot (bf). How do I calculate board feet? For domestic lumber, you can calculate board feet in inches or in feet. Use one of these two formulas to calculate board feet. Rounding up the total to the nearest quarter of a foot is standard industry practice (e.g., 3.8 bf becomes 4 bf). For exotic lumber, standard measurement is by the inch (length only?) and calculated to two decimal places. On the other hand, at a lumber dealer, who sells by the board foot, all lumber is not milled the same, so you end up getting more of the material you’re paying for. Regardless of how much milling has been done, lumber sold by the board foot is more economical than S4S lumber. What do 4/4, 5/4, 6/4, etc., mean? 4/4 (four-quarter) lumber is 1″ thick when rough sawn. When 4/4 lumber is planed, it is typically finished at 13/16″ thick. 5/4 (five-quarter) lumber is 1.25″ thick when rough sawn. When 5/4 lumber is planed, typically it is finished at 1.063″ thick. 6/4 (six-quarter) lumber is 1.5″ thick when rough sawn. When 6/4 lumber is planed, typically it is finished at 1.25″ thick. 8/4 (eight-quarter) lumber is 2″ thick when rough sawn. When 8/4 lumber is planed, typically it is finished at 1.75″ thick. 12/4 (twelve-quarter) lumber is 3″ thick when rough sawn. When 12/4 lumber is planed, typically it is finished at 2.75″ thick. 16/4 (sixteen-quarter) lumber is 4″ thick when rough sawn. When 16/4 lumber is planed, typically it is finished at 3.75″ thick. R1E stands for ripped on one edge. This edge is straight enough to accept a glue joint. Typically, R1E stock has not been surface planed. KenCraft will “clean up” any rough-sawn lumber for $0.20/bf. 1/16″ will be taken off both sides.